Nowadays many people are interested in making a Ladakh Self Drive Trip in their cars and eager to know about how to prepare their vehicle for a trip to Leh – Ladakh. Every day I receive numerous questions related to a self-drive trip to Leh – Ladakh. Travelers are interested to know about what must have things they must carry in their cars as they drive to remote corners of Leh – Ladakh, and Manali – Leh Highway. They are also interested to know about how to prepare their car for a Ladakh self drive trip and any other precautions. Wondering about Things to Carry on Ladakh Self Drive Trip? I have come up with this list of 40 items or products that you may need for a successful self-drive trip to Leh – Ladakh. These items will help you mitigate the risks in a no-mans land where help is hard to come. The majority of the time on a Leh – Ladakh trip, you are on your own especially while driving on Manali – Leh Highway or Srinagar – Leh Highway or other remote corners of Leh – Ladakh less frequented by tourists. Hence, it is important to be self-prepared and ready for some DIY stuff with your car if something goes wrong. Some of the items listed will seem overkill but keep in mind that in the remote Himalayas like Ladakh or Spiti, finding a mechanic is one thing but he having a spare part for your bike or car is another ;). Hence, if budget is not a constraint, it is always better to buy and carry these items than being stuck in the middle of nowhere. I have categorized this list of items into various heads which will help you understand why the item is recommended and what is the need of it by having a mention of the category. In case, you feel the list of items mentioned in a particular category will suffice your need, shop and move to the next category. However, keep in mind that some of the items may overlap between categories, so be aware of not missing such important items. 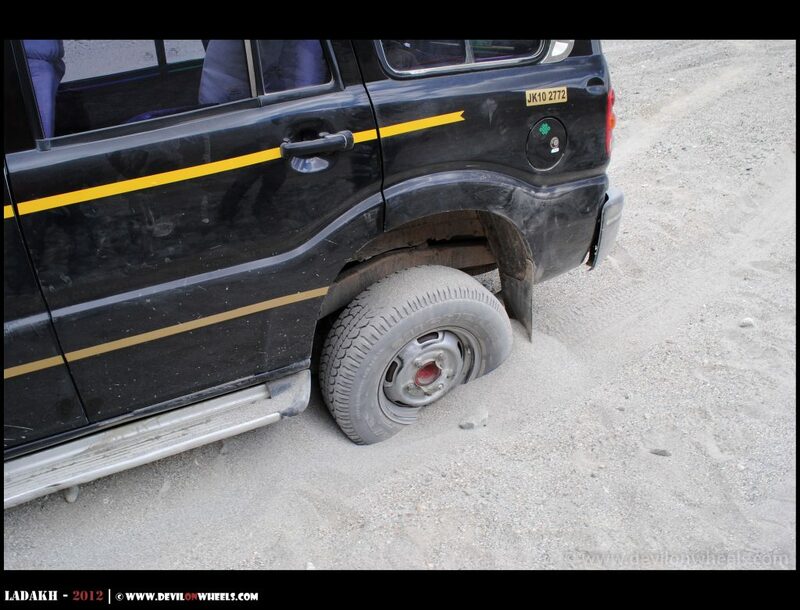 The most dreaded thing that can happen in the remote Himalayas like Leh – Ladakh or Manali – Leh Highway or Nubra – Shyok – Pangong Tso route, etc.. is the punctured tyre or flat tyre or you have battery issues or battery got dead. You must be prepared to repair or overcome the situation of puncture or battery issues without the help of mechanic as help will be hard to find on these routes. Below list of items may help you with the puncture and car battery situations in Leh – Ladakh. 3. Puncture Repair Kit including Tube patches. It has saved us numerous times along with Air Inflator. You can check something like Tubeless Tyre Puncture Repair Kit. 4. Puncture Sealant Kit. It really is amazing when the puncture is beyond repair and you are left with no other choice than using something like Tyre Sealent for all Type of Tubeless Tyres . It can buy you time so you may reach a safe place in case got stuck in a wrong place. The next big thing that comes to mind when you are on a Leh – Ladakh Self Drive Trip is the fact of running out of fuel in the dearth of fuel pump nearby. You can read about Fuel Availability In Leh – Ladakh and why it is important that you must plan for contingencies for running short on fuel while driving on these routes. Below list of items will help you with fuel issues in Leh – Ladakh. Next on the list is being stuck with your car in a water crossing, slush or mud. 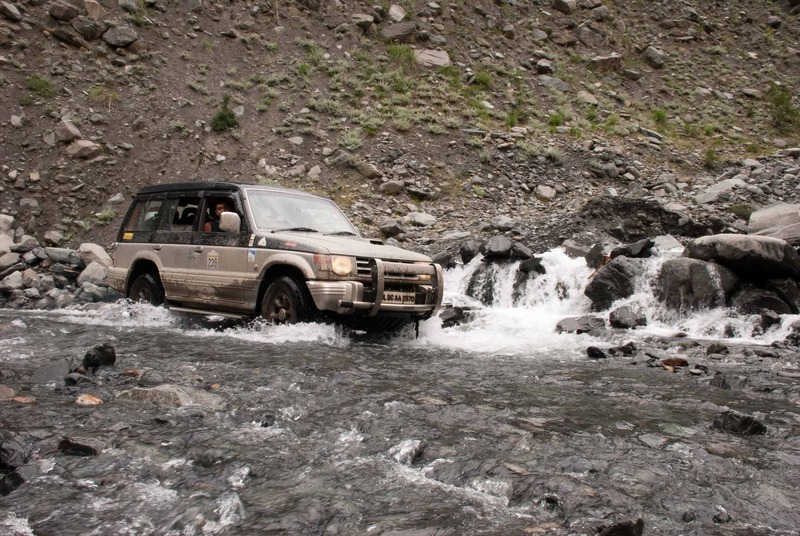 It is the most common scenario of any self drive trip to Leh – Ladakh as people tend to neglect sometimes and get stuck in mud or slush. Sometimes, it is really that ferocious water crossings especially after noon that can catch your car from the knees and make it stuck. 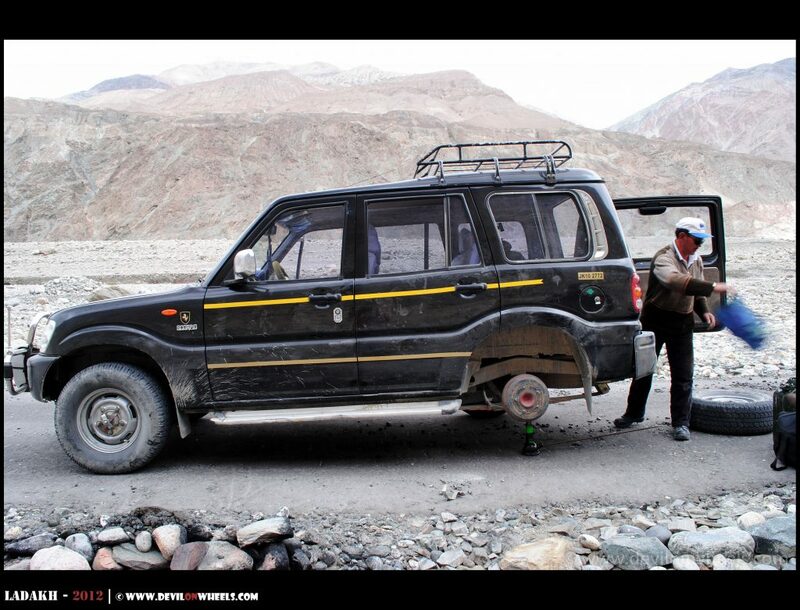 You may need below set of items in order to come out a situation when your car is stuck in Leh – Ladakh. I am a very strong believer in taking care of my car’s windshield because it is the only thing that provides me a driving comfort, ease and of course, beautiful views outside. In case, you do not have a clean windshield or broken windshield, it will create all sough of other issues. Adhesives or tapes are always helpful in many patch-up work situations. Below list will help you with the situations that may go wrong with windshields on a Leh – Ladakh trip. 24. Spare Wipers in case original ones get broken. You cannot drive a car in rains with a wiper. So, worth the investment and can be used in future anyhow. 25. Adhesive Tapes both Double Sided & Insulation Tape which can be used to hold broken pieces and other purposes too. 26. 2-3 Packs of M-Seal, can be used to hold up a part and other purposes too. 27. 2-3 Packs of Quick Fix/Fevi-Quick/Elfy, can be used to hold up a part and other purposes too. Carrying more spares is optional in case you are confident about your car conditions and own some Maruti or Mahindra vehicle whose spare parts are easy to find. You may find a mechanic or someone to help like army folks or fellow traveler, but if you do not have the spare or tools, they might not be able to help you out. However, I will strongly recommend carrying these spares in case you have other not so popular or luxury brands in the Himalayas. 29. Spare Coolant & Engine Oil, important from a contingency perspective. May be a small puncture in engine sump leaked the fuel or puncture in coolant pipe leaks the coolant. In the last, I will share a set of items that will be useful in numerous situations. Some of them will also help you with not only car related issues but other situations as well like a swiss knife or a fire extinguisher. 34. Swiss Knife or Cutter of your choice. I have a Victorinox Huntsman Red Swiss Army Knife which I have been using since 6-7 years. It has helped in many situations in mountains and still work as new. One of the best products I have bought in life. 37. DC to AC Inverter. It is an extremely useful item often neglected. It helps you keep the batteries of your phone charged, camera batteries charged and even laptop or iPhone or iPad charged too. I own a Targus 200W Power Inverter with USB Fast Charging Port and it has proven its worth in day to day life as well not just trips to the Himalayas. This completes our list of items to carry on a self drive trip to Ladakh. Did I miss anything? Well, do share your thoughts or additions/edits to help other fellow self drive enthusiasts planning their upcoming trips to Leh – Ladakh. It will be a great help if you can tell me that Do i require some permission ( pass) during this trip. If Yes, than from where i have to get these. No Rohit, if you are planning to travel from Shimla to Spiti, then you do not need any permits !! Thank u so much dheeraj. Good to hear. Also pls tell me if its possible to the below places in a DL regiatered self drive rented car. If not pls guide me where all its possible to visit on srinagar leh highway. Maitrey at Mulbek, Lamayuru Monastery, Lunar Landscape, Redzong / Rizong Monastery, Alchi Monastery, Likir Monastery, Basgo Palace, Confluence at Nimmu, Magnetic Hills, Pathar Sahib Gurudwara, Phyang Monastery, Spituk Monastery. Hi Dheeraj.. Hope you’re doing great.. We are planning to do leh by sep mid.. entry via srinagar and exit via manali. We are planning to hire a self drive car from delhi. We are already aware by reading ur blog about local taxi union. So we have planned to park our car in leh town and hire a bike for all sightseeing in ladakh. Let me know if this will cause any problem? Or ok to do and safe..
Venkat, it is completely safe and you can surely use the rental car to drive to Leh and then out of Leh. One more clarification bro, planning to exit leh via leh manali highway by oct 1st week beginning. I read in ur article regarding possible snow fall and road blocks due to himalayan motor rally. Please advise how we can plan. Many thanks in advance. Nowadays snowfall is not that frequent in October but possible. Keep an eye on weather updates and I do not think rally is in first week of October this year. Hi dheeraj, we planned our trip on sep 22nd to oct 6th. Planning to enter via srinagar-leh and exit leh-manali.. Hearing some news that there is a early snowfall now. Please give me an update on the same.. Whether it can be done wid out any delays. Where exactly it is snowing or possible snow fall.. I agree v cant predict nature however ur valuable suggestion will b helpfull for us. There is snowfall and it is usual to that snowfall starts in September at all high passes in the Himalayas. Even on your dates it may be possible that snowfall happens, if it happens heavily the pass might close for a day or two at max. but this snow does not stay too much. Keep a tab on weather updates. Your post is sufficient in itself but still have some doubts left. *Me & my gf planning to visit Spiti valley in mid-August (do you recommend this time?) by SUV. *In total we have 6 Nights and 5 Days. Is it Doable? *Tentative total budget for Delhi-Spiti-Delhi keeping in mind to stay in medium budget accommodations at max. *We are using Shimla route for going and Manali route for coming.Your suggestions for itinerary? Place to visit? I am going Spiti through Shimla then Manali with my car (EON) on 18th May. Is that okay to go with EON or shall I switch to some SUV. Thanks a lot for the prompt reply..all your articles are awesome and knowledgeable. I am not going to Ladhakh just the 360 degree tour from Delhi – Shimla- Kaza- Manali-Delhi. Let me know if there is any issue with above plan with EON and also Chandratal will be frozen in May or we can go to Manali from KAza or not. One more thing: Also, any bike service available in the Leh – Manali route? 2) Is Motul Aerosol tyre inflator reliable one? No Dennis, there is no service available on Leh – Manali route. The tyre inflator does help you buy sometime and few KMs. Any workshops/ tyre repair shops available for enfield bullet at any place in Nubra Valley? Dennis, you will get the mechanic at Deskit. Thanks…I have changed my itenary and added Hanle…also I have decided to breakup Day 13 and will take a night halt at upshi….Did not want to leave Tanglang la….Are there any stay options at upshi….. Yes Sunil, Upshi and Rumtse both have basic home stays and guest houses. But do not expect much from these places. I am planning a trip to Leh in September. Earlier I was planning one to Spirit but got a few more days and decided to take it to Leh. My itenary is as below..